The Eden Plain School was built in 1868 on Eden Plain Road, on land donated by John Pearce. It served students for 38 years before being replaced by a two-room schoolhouse named Knightsen Grammar School built on Delta Road in 1906. 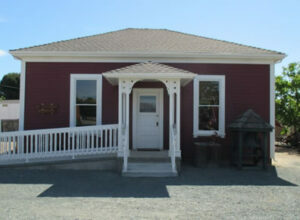 At this time, the Eden Plain School was used as original rooms of a home for Moody Family. The building was donated to the East Contra Costa Historical Society in 2003 and fully restored by volunteers to its present state. School desks appropriate to the 1800’s were gathered and restored as well by an ECCHS volunteer. The original school bell from Iron House School was donated to the museum and calls children to class during 3rd grade visits.